Chicken Afritada is another popular Filipino dish. 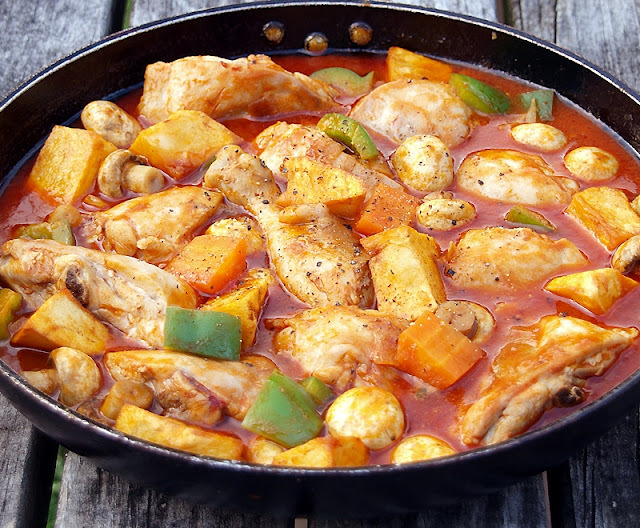 Basically, it is cooked in tomato sauce with carrots, potatoes and bell peppers as the main vegetables. Some prefer to add green peas and hot dogs as well. Another variation will use both pork and chicken or will use just pork. I like my afritada simple and easy, with just the basic vegetables. 1 Heat the oil in a large saucepan and lightly brown the chicken. Remove the chicken and set aside. Add the garlic and stir-fry until golden brown, then stir-fry the onion until translucent. 2 Return the chicken to the saucepan, add the tomatoes, bay leaves, salt, pepper and water, and simmer over low heat for 20 minutes. 3 Add the potatoes and simmer for 15 minutes, then add the pimentos and simmer for another 5 minutes. Remove from the heat and serve immediately.